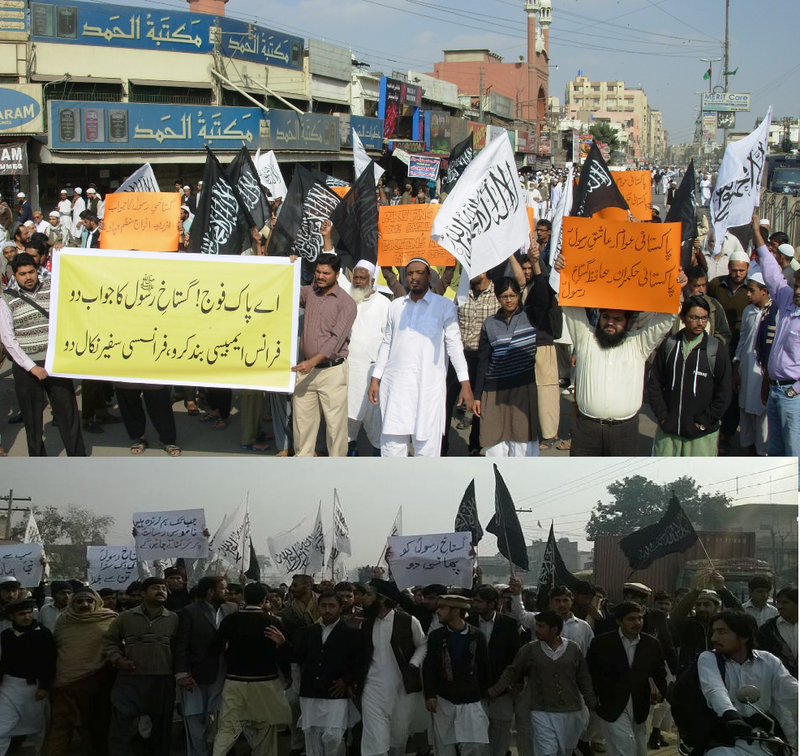 Hizb ut-Tahrir in the Wilayah of Pakistan held demonstrations across Pakistan against the publication of cartoons in the French magazine, Charlie Hebdo, attacking the honor of RasulAllah (saaw) and the support provided by French government to this heinous act. Participants held placards declaring “O Pak Army! Avenge RasulAllah (saaw), Close French Embassy and Expel French Ambassador” and “Mobilize Armies in Jihad, In Honour of RasulAllah (saaw)”. Protesters maintained that the people of Pakistan are lovers of RasulAllah (saaw) but the rulers maintain friendly relations and receive guards of honor and medals with pride from those Kuffar who support this evil act. If on the very first day Muslim countries, including Pakistan, would have expelled their French ambassadors and closed their embassies from the Muslim world, people would have no reason to be on the streets. However, the weak response from the Muslim rulers is encouraging France and other western powers to attack Islam, RasulAllah (saaw) and Muslims. The Muslim rulers have gone so low that they are not even condemning by mere tongue. Rather, they are requesting the Kuffar to not dishonor RasulAllah (saaw). Protestors maintained that today the Kuffar are attacking Islam, RasulAllah (saw) and Muslims politically, economically, culturally and militarily because Muslims do not have their Khilafah which would have united the Ummah, its land and its forces and responded against these slanders in a befitting manner. Protestors demanded from the sincere officers of the armed forces that they must close the French embassy and embassies of any states supporting dishonoring of our Prophet (saaw). They also demanded that they must extend support for the establishment of Khilafah, the shield which will defend Islam and Muslims and bring to their enemies a humiliating defeat.